It's such a simple operation, you'd think everyone already knows how to copy, cut and paste. But my father has asked me how to do this several times, and chances are you probably get asked simple questions like this all the time. First, another FAQ: What's the difference between copying and cutting? You can think of it like an actual piece of paper, for example a letter. When you photocopy the letter, it creates a duplicate and the original stays intact. Cutting a block of text out of the letter, on the other hand, removes that portion from the letter. On your computer, when you copy a file, image, text or other item, it creates a duplicate of that item in your computer's temporary memory. Cut an item to remove it from the page or folder it's on and hold it in memory, as above. You can almost always copy (duplicate) something, like a phrase on a web page, but cutting is only possible if you have editing or administrative control of the item. For example, you can't cut phrases out of web pages you visit in your browser (imagine what the web would look like if everyone could!). There are exceptions, like editable websites like Wikipedia, but that's because you have editing control on that site. Once you've copied or pasted something into memory, you can then paste it into another document, file, or folder. Here's how. If it's a file in a folder that you want to copy (to duplicate) or cut (to move) into another folder, click on the file to select it. For images, right-click on the image, then click on "Copy" or "Copy Image" depending on the application. If you want to copy some text, highlight it by clicking just before the first letter you want to copy, hold down the mouse button while dragging your mouse to the right, and then releasing after you have selected your text. Tip: In some applications, like Thunderbird, you can select all the text and images by right-clicking and choosing "Select All". Next, in many applications, you'll see at the top of the application window, "Edit" right next to "File". Click Edit to reveal the drop down menu and select Copy or Cut, depending on what you want to do and if cutting is an option. OK, now that we've selected the item and copied/cut it into memory, we can paste it somewhere else. 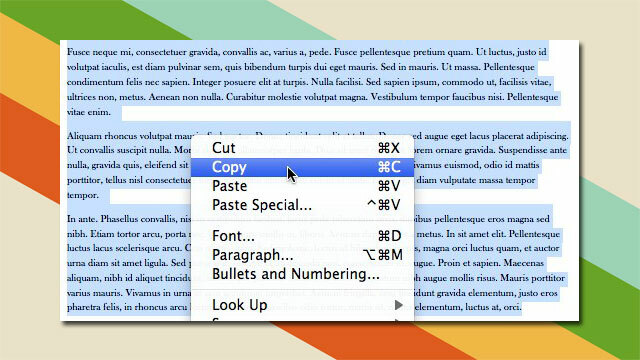 In your new document or folder, go back to Edit and select Paste. Alternately, if you don't have that Edit menu (e.g. in Windows Explorer), right-click in the document or folder and select Paste. Copying, cutting and pasting with your mouse is pretty straightforward, but using keyboard shortcuts can save you a lot of time. Once you get the hang of doing CTRL + C, CTRL + X and CTRL + V (or the Command counterparts), you'll be copying, cutting and pasting like a pro. I had the same problem with my Grandfather. I teach him and he still forgets. So I wrote a post where he can practice cutting and pasting.